Fluffy and I took a little field trip last Wednesday. 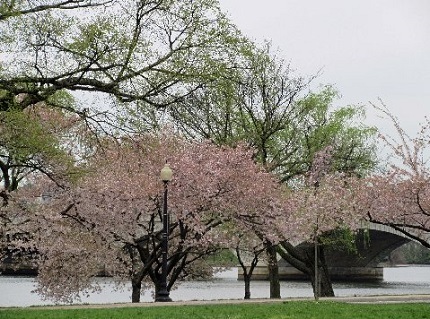 We drove across the river into the District (what the locals call Washington, D.C.) to look at the cherry blossoms because they were there. 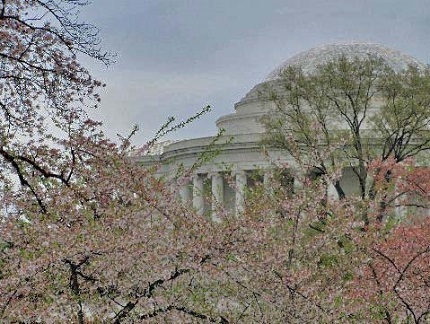 It didn’t seem sporting to ignore them because we live a formidable 29.5 miles from the Thomas Jefferson Memorial, which is Ground Zero for the cherry blossoms in Washington, D.C., each April. 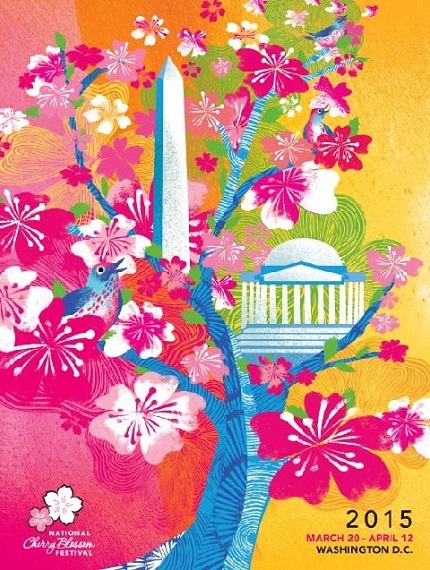 This is the poster for the 2015 Cherry Blossom festival. Later on I will post a picture of Fluffy. If you are observant you will see the same poster on his t-shirt. Going into the nation’s capital isn’t something we do every day. 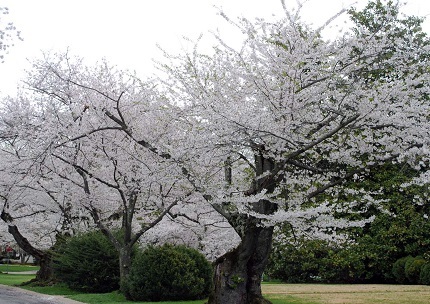 In fact, the last time we did it was, coincidentally, when we went to see the cherry blossoms last year — which was the first time we ever saw the cherry blossoms, even though we have lived here since 1987. You might say that if you were coming to this area to be tourists, Fluffy and I would not be the people you would pick to be your tour guides. On the other hand, if you were looking for weird places to go, perhaps you might want Fluffy and me as your tour guides. Because Fluffy and I did not immediately head for the Tidal Basin, which is where most of the tourists went to see trees and where most of the branches were bare. No, we went to a secret place that most people do not know about. Well, only some of the locals and about a hundred thousand Japanese tourists know about this spot. 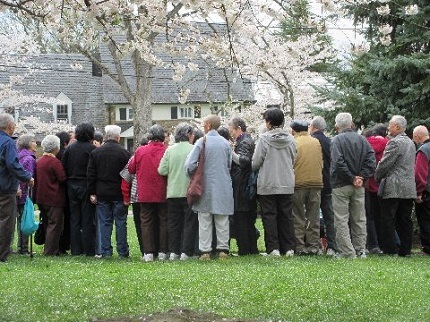 Although most of the locals do not even know about this secret cherry blossom subdivision, people from Japan fly here to look at it, and people from Japanese rest homes take tours to look at it. 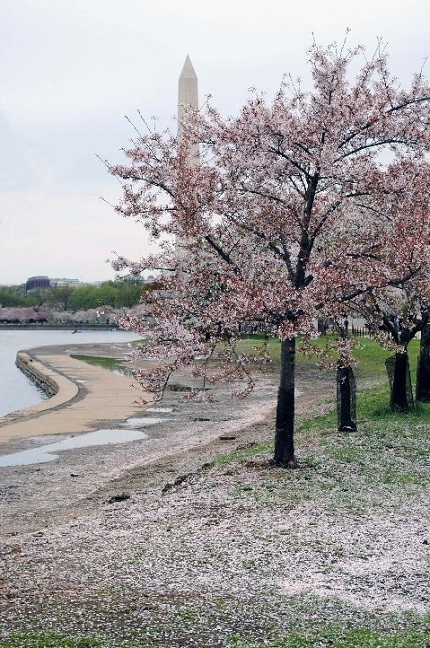 I’ve been looking for internet confirmation of this tale without success, but what I’ve heard is that the man who was behind getting the cherry trees planted around the Tidal Basin managed to get a few thousand of them also planted in his own neighborhood in Maryland. Fortunately, Fluffy and I (and the entire country of Japan) have directions to that neighborhood. As soon as rush hour was over on Wednesday morning, off we went to the secret location. The residents of the community welcomed us with open arms, many of them displaying “Do Not Park” signs in front of their houses to enhance our enjoyment of beauty of their neighborhood. 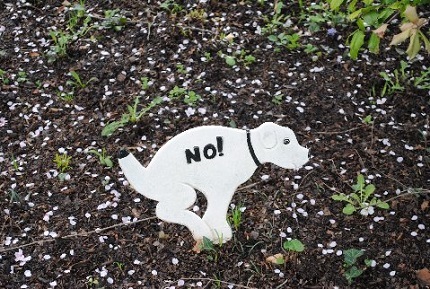 Residents of the cherry blossom neighborhood were as welcoming to tourists as they are to local pets. Fluffy did find a picturesque place to park. He wandered off with his camera, leaving me with my beloved purple point-and-shoot. Although I never left the car, I was able to find plenty of places to take pictures from the comfort of the car seat while he roamed the neighborhood with his Nikon. Both of us were happy. Although it was not the sunny day we hoped for, Fluffy was able to walk through trees that were laden with cherry blossoms. It was spectacular. The trees were full of flowers, and there were also tulip trees, dogwoods, and forsythia for him to enjoy. The trees lined each side of the road, with their branches almost meeting in the middle. They were lovely. 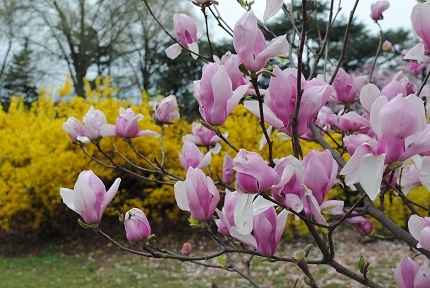 After all the white cherry blossoms, the tulip trees and forsythia provided welcome shots of color. As for me, I was able to look at the moss on the bark of the nearest tree, and the roots of that tree. I am not saying this sarcastically. I like to look at things like that. I never get tired of nature. 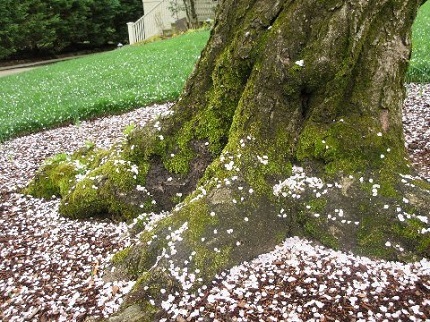 I also enjoyed looking at the rain of petals, which were caused by tiny gusts of breeze. I like the colors of the moss and the grass and the bark and the petals. Fluffy returns to the car. 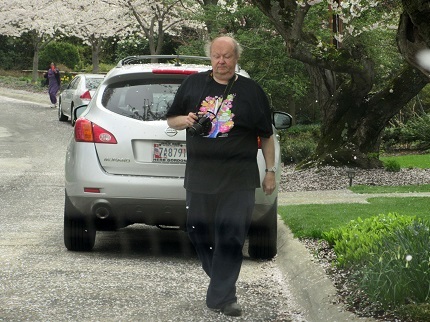 Note the shower of petals around him, and the petals on the ground, and the design on his t-shirt. It’s an almost perfect picture, except that he’s looking down at the ground. You can’t have everything! 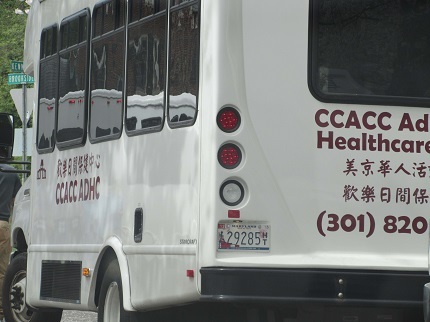 We finally left our secret location, after being blocked by only about a half dozen vans like this one — vans that reminded us that although not many people we know are aware of this secret location of cherry blossoms, people across the world are all too aware of the cherry blossoms we had come to see. A half dozen vans like this one were in the process of disgorging their passengers and taking them up again. Cameras (no doubt of Japanese manufacture) were snapping pictures like crazy. Fluffy and I then decided to take a trip to the Tidal Basin, just to see if there was a single cherry blossom left. Those cherry blossoms bloom before the ones at the little community in Maryland, and we had heard they were on their last legs (or petals?) that previous Saturday, for the annual cherry blossom parade. But as long as we were out we decided, what the heck? We might as well make a day of it, so we did. Just as we had heard, the blossoms were about gone. If you looked at the trees up close, the branches were just about bare. But if you took the pictures from far away, everything looked pink and pretty. So that’s exactly what we did. You can see the carpet of cherry blossoms on the ground, but it’s hard to see from the picture that the branches here are almost bare. 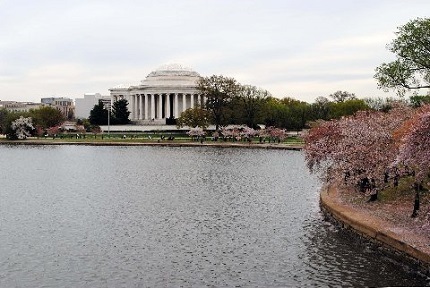 The Jefferson Memorial is always a majestic sight in Washington. This was my view of the Jefferson Memorial from the car. The Arlington Memorial Bridge, which is just called the Memorial Bridge around here. This is the bridge that goes between Washington, D.C., and the Pentagon. When I was sitting in the car on Wednesday morning, it was so peaceful and beautiful. Artists set up easels to paint. Mothers walked the streets with babies in strollers. Gentle breezes blew petals in the wind. There were women in saris. There were people in jogging suits. There were women in dresses. There were people in jeans. People come all the way from Japan to wander down the streets of this subdivision every year, but it took Fluffy and me 27 years and 29.5 miles to see this natural wonder. What other opportunities are we missing? What opportunities are you missing? What doors are right in front of us that we only need to reach out and turn the knobs to open?